I was in New Zealand for one week after the Parliament of the World’s Religions. I got to see a peace (nativity) labyrinth my last night in town as it was opening night. I am in Sydney now and leave on Tuesday. Glenys Livingstone, whom I met at the Parliament, invited me to a summer solstice ritual last night. When I get home, I get to celebrate the winter solstice with Proteus Coven. Culture/climate shock. I attended church at St. Andrews Cathedral for cultural experience. The worship service was a Christmas musical celebration. It felt early to sing Christmas songs. I have maintained the tradition of attending Christmas Eve services with my family to honor them...so singing Christmas songs didn’t feel unusual, singing them on Dec. 20 did. I am in the Central Business District of Syndey. There is a Theosophical lodge and bookstore around the corner from my hostel. The lending library is open Tuesday morning, in time for me to visit. After some extended post-panel analysis with the Australians, Anna and I went off to visit some of the information booths in the Exhibit Hall. I was quite taken with the triple size booth maintained by the Religious arm of the Iranian government. They had a beautiful setup with carpets, a sitting room for guests, a small kitchen churning out Persian pastries, a bookshop, and more. They were giving away a CD on Iran and a small book on religious diversity in Iran (notably excluding Baha’is, unfortunately). I was admiring some books of mosque architecture when a gentleman came up to help me. I asked if they had any books on the early Prophets, especially on Nabi Idris (PBUH) [aka Hermes Trismegistus]. We got in to a short discussion and the gentleman seemed surprised at my knowledge of Islam. He gave me a DVD that they normally sell, containing several reference works on Islam. He gave me his card and said that if I had any further questions, I should contact him. He is Mojtaba Soltani, Senior Adviser to the Secretary General of the the Ahl-ul-Bayt (a.s.) World Assembly, the central administration for Shia Islam. I thanked him and gave him my card, explaining who I am and that I represent CoG. He asked me to send him any information that I thought the Ahl-ul-Bayt should have to educate their people on religious diversity. This is an interesting connection to have made. I’ll have to consider the likely consequence of follow-up when I get home. On the way out, we passed by the booth maintained by Hinduism Today magazine. These folks are Americans and have expressed an interest in identifying as “Pagans” and working more closely with us. I think this is great and Hindus have always been involved in any interfaith events I organized under the label “Pagan”, but it might require some reconsideration of the “Pagan” = “European” paradigm in use at this Parliament. We’ll see. Back upstairs, but a little early for the next program, Anna and I visited the lobby area set aside for the Gyuto Monks, which included explanatory panels, and area for services and meditation featuring a photo of the Dalai Lama, are for sale, and a large sand mandala that the monks painstakingly constructed over the course of the Parliament. 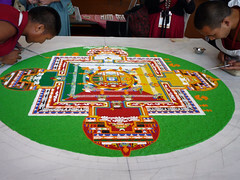 I chatted with one of the monks, asking if the square platform on which the sand mandala was made was oriented to the directions or just conveniently placed in the room. He explained that it was the latter, and that in their view the mandala was a microcosm of the universe, so the directions oriented themselves around it. We agreed that everyplace is the center of the universe (or, as Buckaroo Banzai would say, “Wherever you go, there you are.”). Monday, December 7, 9:30am at the 2009 Parliament in Melbourne – The Australians speak! We made it to the Conference Center in time for me to Chair / facilitate a 9:30am panel of Australian Pagans called “Australian Pagans Speak: A Community Forum”. Several Australians who had proposed their own programs had been lumped together by the Parliament into a single panel. This made for a complex situation, since folks who had talks planned for 90 minutes now found themselves squeezing their material into 12 minutes. (They commented that it seemed weird to them that the Pagan programming was so full of Americans.) I was asked to facilitate to keep things moving and on time. The Australians had spoken with me and said that they welcomed my assistance. She was followed by Glenys Livingstone. She spoke about the problems of living in Australia and reading Pagan books all set in Europe. The symbols, directions, Quarters, circle direction, deities, etc. all seemed out-of-place in Australia. 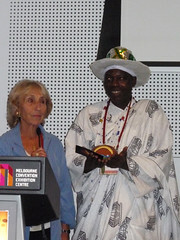 She and her partner Taffy developed their own approach to relating to the Sacred Earth in Australia, a tradition called “Pagaian”. Fabienne Morganna is from Melbourne and is a Justice of the Peace! She spoke about Australia as a land of “hybrids” of creatures familiar to Europeans: the platypus, the kangaroo, the echidna, etc. She wove a clever and humorous story explaining why it should come as no surprise that Australia would be a land of Solitaries and Eclectics. 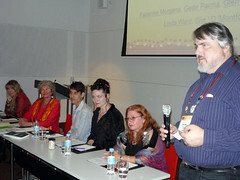 All in all, the panel did a great job of representing the unity and diversity of Australian Paganism. Each addressed different aspects of the Pagan experience in Australia. I forgot to include that between the Lost & Endangered Religions Project program on Sunday and the URI Wisdom & Vision Council meeting that evening, many of us were on webcast TV! The Interfaith Center at the Presidio has live webcasting capability on it’s website www.interfaith-presidio.org/Media/vidder.html . We originally thought of this as a great additional service to provide for couples getting married in the Chapel. Family back home who couldn’t attend could see the marriage ceremony live. Just a few months ago, when we broadcast a series of live presentations with the Joseph Campbell Foundation, we suddenly realized that we had our own interfaith TV station. We made arrangements with the Parliament to get broadband wireless access and to webcast many of their sessions, but shortly before we left for Australia, something happened and it all fell apart. We arrived here scrambling to find places near the Parliament where we could do interviews and trying to arrange internet access, which is VERY expensive here. We had designated Sunday as “Pagan / Indigenous Day”, so after the LERP program, several folks hustled over to the attached Hilton to squeeze into a room and do interviews going out live. Raul went first, with Rachael translating for him. Then I interviewed Linda Ward, Belinda David, and Helen Gilmour – all members of the Pagan Awareness Network (which is here in force), Interfaith Australia, and Pagan Hearth. They reported that when they had first tried to do national interfaith work, just a few years ago, they were told that it was ”international convention that Pagans not be included in interfaith events”. Well, of course, they were able to prove this wrong, and through diligent local effort were now involved in national interfaith work in Australia. 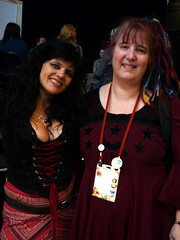 After the Australians, I interviewed Anna and Michelle for an American Pagan view of Pagans at the Parliament. Michelle added comments about the youth programming. She also mentioned that there were a lot of folks in the Q & A sessions of programs asking questions about LGBT participation in religion. In fact, LGBT representation at the Parliament has been an ongoing issue for over 15 years. Out of almost 700 programs at this Parliament, there are only two that explicitly address LGBT issues. Letters about this have gone to the Parliament before, and probably will again. We’ll see if it makes any difference. The Parliament is over and I am taking the train to Adelaide to see a bit of the country and digest the events of the last few days. As the trip is eight hours I thought that this would be a good time to begin the somewhat arduous task of sorting out the impressions and conclusions with which I have come away. I discovered that being pulled in so many directions has both its advantages and disadvantages. I did meet a lot more people than I probably would have had I focused on only one group of people and presentations. On the other hand I don't remember much of a distinct nature. There are two events that stand out in my mind however, both related to indigenous work. As in much of the Parliament neither of these events were expected on my part. The first was a dinner into which I was scooped up after the URI reception. Charles, Yoland, Raul and a few other people had decided to go to dinner and brought Don and I along. 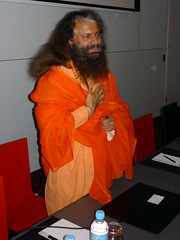 As one of the folks was a Swami the dinner was vegetarian, Unfortunately it didn't occur to either Don or I to ask if it was Indian until we were already there, and Anna who would surely have thought to ask, was attending a Pagan event. As Don is literally deathly allergic to something that remains illusive but is apparently pervasive in Indian food, he was forced to take a taxi and return to the center of town. I found myself seated between a young woman and Uncle Max Dulumunmun Harrison, an indigenous elder, for dinner. Raul had chosen to give me a break from translation by seating himself across from Yoland next to Charles, and the young woman, who seemed to know Uncle Max pretty well, spent most of her time in conversation with the Swami which left Max and myself at the end of the table to entertain each other. Max is an elder of the Yuin people. He talks the way most indigenous elders here do, in stories. Most of the conversation involved a brief exchange, a question from me and a story from Uncle Max. One learns a great deal of patience when talking to these elders. Their stories are generally long in contrast to the shotgun style of most conversations today. I asked him whether he has gone away to boarding school at one point in the conversation and got this story. When I was a young fella out in the Bush see, I musta been about 10 or 12, my elders came round and told me, "come on, its time you learned something." So I went along with them see, and they took me out and they took me to this tree and they said, sit yourself down ‘ere. So I sits my backside down against this tree and I kinda wiggles down into the roots and the dust and leans back against the tree trunk see, and I waits to see what it was I was supposed to learn. So these fellas goes off and starts talking men's business and leaves me there. Well pretty soon I'm looking around for something to do and I finds a twig from this old tree and I starts drawing in the sand like. Well one of the elder fellas looks over and he says, "'ey, who told you to do that?" and I looks up at him and I know I'm in trouble so I says real respectful, no one elder. An ‘e says "put that aside now." So I do an for say, maybe another two hours I just sits there. I sits there real quiet wondering what it is I'm supposed to be learnin and when. Then one of the fellas says "'ey I think you've learned about enough for one day, I guess you can go on now." See? So all this time what do you suppose it was I was supposed to be learnin'? I smiled and said, "Patience." He grinned at me a moment, winked and said "exactly". That was all the answer that I ever got from Max about his education. Being a Parliament event the subject finally got round to rituals and celebrations and When I asked Max what it was he celebrated he said "oh ya know, all the usual holidays, Easter, Christmas and the like; don't ya"? Of course I told him no, that I celebrated the Solstices and Equinoxes, and that right now we were in the dark time of the year and I told him the story of the Wild Hunt and the time between Samhain and Beltaine, the two times of year when the veil is thinnest and we can talk to and reconnect with our beloved dead. I told it as Max had shared his stories; I told it as a story of my people, and Max listened with a quiet intensity that drew me into to story as well. When I was done with my story he just looked at me for a moment, really looked at me. He then took a deep breath and said quietly, "I really love that." That was really the last conversation that I had with Max though we worked together in one workshop. I had wanted to interview him and he had said that he had a couple of students that he wanted to put forward also to give them responsibility but I only saw him once more when he appeared by my scooter out of nowhere for a moment, and said not to worry, that we would catch up with one another again. I didn't understand what that meant but the next day he was gone along with several other elders. I still don't know what that was about. Despite the continued hype about this parliament being the first to honor the indigenous and its preparedness to listen to their concerns, it was clear in so many ways that they just did not get it. On the second or third day Raul and I went to a morning service by Francois Paulette, a Dene from the planes of Canada. We walked into this room and he sat down perplexed. I walked over and asked what was wrong. He said he couldn't do the service in this room. He sat for a moment more and then asked me what was the protocol. "I don't quite understand the question, for this meeting I asked?" "The protocol is whatever you want it to be. Do you want a circle?" He just looked at me then. He had been looking at his hands. He nodded. "Ok then you will have a circle." I told the two young men that were setting up the room to get rid of the rows and make a circle of the chairs, but they just stood there for a moment and looked at each other, then told me that they didn't have any instructions to do that. "I'm giving you instructions." I said. "Mr. Paulette wants a circle. If you can't make on I will." "You aren't allowed to move anything around. Its against the contract." They told me. "You move them or I will." They stood there about two ticks longer then I cared to wait so I turned to the people who had arrived during my conversation and said, "Folks, our Elder Brother Paulette wants a circle. Lets get these chairs moved." And of course we did. The two clowns in black hurried off to tell someone but never came back. Elder Franscois was much happier and settled into storytelling mode happily, after which he led a calling to the four directions asking their blessing for the day and of course, the Ancestors. This in itself was not much as Pagans are used to moving into a space and making themselves at home, but I was really pleased when a few days later, at another gathering, Elder Francois, who was once again opening, stood up, hesitated, looked at me for a moment and then said, ‘Folks I am very uncomfortable here with these chairs, We work in a circle. Let's all create a big circle so that we can see each other." There were a number of ways in which they continually proved their total blindness and insensitivity to the needs and energies of the indigenous people. In one instance Raul pointed out that a meeting for the indigenous was held in a convent, which is the primary symbol of colonial oppression. He reported that the energy was muddy and sluggish, that everyone was expected to sit in rows where they could not ‘see' each other and that while they covered the fireplace, a symbol of indigenous gathering they left the alter uncovered. He was highly incensed that an agenda had been laid out rather than allowing the group to choose its own and complained that there was little or no time to "make connections" which was the main reason why he had traveled so far to be at this event. (He plans to write a full report when he gets home, which he wants me to translate and post as well.) He did say that it was better when a circle was created and everyone was smudged. In general Raul was very disappointed in this Parliament. He said that on a scale from one to ten, this was about a minus two. At one point later in the secessions there was a report from the indigenous gathering on what was determined at a special all day workshop, and during the report Raul leaned over and said that we needed to leave; that he couldn't take the hypocrisy or the bad energy anymore. So we left to get lunch. I am not certain to what he was referring but I do know that there were none of the indigenous leaders present that had been around earlier, and I know that when all the indigenous folks at the earlier meeting were coming in, all they knew was that they had been invited to attend this wrap-up. It wasn't until a couple of them were pulled from the audience that any of us knew who would be speaking. I know that Yoland spoke up against some of the same inequities that Raul had mentioned because she told us later that she had looked around the room for him to come up and support her words but we had left do something far more important, in Raul's opinion, lunch. I am really sorry for this turn of events, because it really left a bad taste in Raul's mouth, as we say. He felt that the indigenous people should have been modeling the values that they had been talking about for the week, and he felt that they had sold out in the end, losing face and integrity. I tried to explain that they were working within the system and as such some compromise was necessary. I explained that, in fact they had achieved one of the goals that they had come with and that was to make the "World's Religions" aware of the fact that the United States, Canada, and Australia were the only nations to refuse to sign the United Nations Declaration of the Rights Indigenous Peoples , which was a very important strategic move, and that they had brought forward the Doctrine of Christian Discovery as well, but he failed to be impressed. He continues to feel that it is the roll of the indigenous player is to model the values of sharing, community, actively living in balance with nature, reciprocity, and the combined values of equality, equity, and justice all in balance with nature and her natural laws. He has come away with a firm commitment to learn English throughout the coming two years and hopes to become proficient in time for the next Parliament. He also comes away with a better understanding of the necessity to begin now to raise funds and has asked me to explain budgets and their functions. We are in the process of assuring that Skype and high speed internet are available and paid for on a continuous basis for both Raul and Alejandrino in order that both will be up to speed by the time that they are called on to participate in an English Speaking environment again. This will be a huge challenge as both men are in their fifties and neither has had any real contact with English prior to this. Raul has never spoken any other language though Alejandrino speaks Quechua. Wish us all well. We plan to bring each of them up to the states to visit late next year for an emersion experience. At 2:30pm, I presented “The Lost & Endangered Religions Project: Preserving the World’s Religious Diversity”. I was almost late to my own presentation, as folks stopped me on my way across the multiple football fields that is the main lobby of the Parliament. About 40-45 people were there for this presentation. The centrally broadcast PowerPoint system worked well, until the screen on podium crapped out midway through. I had to stand away from the podium microphones to see what was on the screen and I couldn’t use the built in pointer to point to anything. I started by explaining that the lineup of presenters for this program had changed since the program guide was printed. Drs. Archana Venkatesan and Layne Little were on their way to India even as we spoke due to changes in their grants. Also, LERP had developed a partnership with the Iniciativa Indigena Global since submitting the program proposal, so IIG Director Raul Mamani was there to present with me (with Rachael Watcher translating). I went through the story of the founding of LERP… In 1997-8, Anna and I were traveling in Eastern Turkey and had the opportunity to spend an evening with a village of Yezidis near Viransehir. The Yezidis are a religious minority in Turkey somewhat akin to Gnostics. In the course of learning about their religious traditions from the village elders, I asked about scriptures or religious texts. They told me that they had once had such texts – especially one called “the Black Book” – but that in their many forced resettlements they had been lost four generations before. As it turned out, a Western comparative religionist – Isya Joseph – had collected these texts in the late 1800’s and published them in 1919. I had a copy of this book in my own library back home. Upon our return home, I was able to make copies and give these sacred texts back to the Yezidi community. I received a letter from the village headman – Ali – thanking me for the return of their scriptures and saying that if I returned, Elders from the surrounding villages would like to meet me. How often have Western academics entered marginal cultures, collected their songs, stories, etc., returned home, written their dissertation, and left the collected data to sit in an archive somewhere? And how often has the collected traditional material subsequently died out or been lost in the community from which it was collected? In early December 1999, the second Parliament of the World’s Religions in the 20th century met in Cape Town, South Africa. For eight days, 7500 people (representing almost every religion on Earth) met, talked, attended programs (over 900! ), and celebrated together. For three of those days, a smaller group of 300 of us – representing of religions and institutions of civil society – met in the Parliament Assembly. The purpose of the Parliament Assembly in Cape Town was to discuss and approve a document titled “A Call to the World’s Guiding Institutions” and to develop interfaith service projects in which the religions of the world could work together to benefit humanity. This idea was very popular at the Assembly and was singled out for presentation to His Holiness, the Dalai Lama. Returning to the United States with a letter of endorsement from the Council for a Parliament of the World’s Religions, I set about contacting appropriate individuals in the academic community, seeking support and advice. Our first project – helping the Yezidi of Eastern Turkey – was already underway. For our next area of interest, we turned to my original research goal in Turkey in 1997, the ruins of Harran and related sites. The city of Harran, in what is now southern Turkey, has always been a crossroads. As a center of translation from Greek and Latin into Arabic, it was the crossroad between antiquity and the modern age. As the Western end of the Silk Road, it was the crossroad between Asia & Europe, as well as the very volatile border between the Islamic world to the East & South and Byzantium & Christendom to the West & North. In its 3000 year history, Harran has been ruled by Assyrians, Persians, Seleucids, Parthians, Romans, Byzantines, Crusaders, Arabs, and Mongols. It has been home to a remarkable variety of religious communities, including the indigenous cult of the Moon God, late antique Pagans, Sabians, Zoroastrians, Manichaeans, Mandaeans, Christians, and Muslims. Harran figures prominently in the scriptures of many of these faiths and they appear to have lived together at Harran in relative peace. Harran occupies a special place in the intellectual history of the Western world. When Plato’s Academy in Athens was closed, its last teachers resettled and founded a new school at Harran that flourished up into the 11th century CE. When the Caliph Umar II founded the first Muslim university in the 8th century, he brought the last remaining scholars from Alexandria and installed them at Harran. The scholars and schools of Harran were instrumental in the translation, preservation, and transmission of Greek and Roman knowledge (especially Neoplatonism and Hermeticism) into the Islamic world and thence into the European Renaissance. Harran was lost to the world in a unique way. In the 13th century, the Mongols conquered the area and decided that Harran was too much trouble to control, too remote to garrison, but too valuable to destroy. They arrived at an unusual and dramatic solution… They deported the populace of the city, walled up the city gates, and left it. There is no record of the city being destroyed, sacked, or burned. The space enclosed by the city walls gradually filled up with wind-blown dirt. Given its significance for so many religious groups and fields of study, it is remarkable that Harran remains virtually untouched by both treasure-hunters and archaeologists. Today, Harran stands at another crossroad, between its own preservation and its destruction resulting from a dam project on the Euphrates, the attendant irrigation, and local economic development. The Harranian plain has gone from being bone-dry for well over a thousand years to being so over-watered that the most serious health problem in the area is malaria. The site is above water, but the ruins – and the treasure trove of texts all archaeologists agree is waiting, will be underwater when the water-table rises. The city walls will act as a coffer dm for a while, but we only have about 15 years before one of the greatest storehouses of knowledge from the ancient world is irretrievably lost. “Harran: At the Crossroads” will bring together scholars working on the many facets of Harran’s history, focusing on the need for excavation and preservation of this unique, virtually unexplored, endangered site. One of the sites related to Harran is the Harranian temple complex of Sumatar Harabesi. Just about 30 kilometers NE of Harran, in the Tek Tek mountains, is the small village of Yağmurlu, built over the ancient site of Sumatar. The bare hilltops are covered with 2nd century inscriptions in Syriac, carved with images of the Harranian Moon God “Sin”, and crowned with seven temples dedicated to the seven classical planets. Each temple is a different geometric shape. For 50 years, the only available map of this site was a sketch map made in 1953 by Prof. J.B. Segal. The arrangement of the hills with planetary temples suggested astronomical alignments, but the sketch-map was too crude to be certain. Accordingly, a LERP team has made three visits to the site to map it more accurately with GPS and compass, resulting in a radically different map. LERP is also interested in helping the village of Turgut in SouthWest Turkey in its revival of the Hekatesia – the traditional festival of Hekate held at the full moon in September – in connection with the excavation and rec9onstruction of the nearby Temple of Hekate at Lagina. It’s not always older religious traditions that are in danger of being lost. New religious movements are often unaware of the importance of their historical materials until it’s too late. After all, the founders of a tradition may not think their napkin jottings worth saving, but subsequent practitioners may be very interested a hundred years later. Accordingly, the Lost & Endangered Religions Project is also interested in working with new religious movements to archive their historical material. One such project is the Wiccan History Project. Focusing right now on the papers of Gerald B. Gardner – sometimes called “the father of the modern Witchcraft movement” – LERP works with existing collections of historical documents to make sure that digital copies are shared and archived in multiple locations so that material cannot be irretrievably lost by the loss of a single site. This collection includes some of the earliest texts of the modern Witchcraft movement, including illuminated manuscripts. Recently, I made the acquaintance of Prof. Yang Fuquan of the Yunnan Academy of Social Sciences. He works with an indigenous people called the Naxi in Yunan Province in Southeastern China, bordering Tibet. They practice an indigenous religion very similar to the Bon practice of pre-Buddhist Tibet. In fact, Bon practitioners will make pilgrimage to Yunan to recover lore that has been lost in Tibet. The Naxi have a form of writing that is probably the most purely pictorial on Earth. It is as if you “wrote” the story of Genesis by drawing an ocean, then land, then animals, then a man & woman, then a tree, then a woman & a snake. There are thousands and thousands of Naxi manuscripts – many preserved in institutions across Europe – but they are preserved as art objects. Without the living stories, their meaning is lost. Prof. Yang and I, working with one of our academic advisors Dr. Gus diZerega, came up with a plan to collect these stories. We could distribute over a hundred low-cost cassette recorders in Yunan with instructions on how to gather stories from Elders. Each tape returned to LERP with an explanation of context and details of collection would (after copying and archiving) result in the return of the tape along with more blank tapes. This would turn many Yunan residents into “field-agents” for LERP, preserving their own culture. We have been frustrated by Chinese authorities who don’t want blank tapes imported into the area, but we are continuing our efforts and exploring digital recording options. Dr. Layne Little and Archana Venkatesan, head LERP’s projects in South Asia, but I had to present on their behalf. There are two main south India projects, which are both concerned with performance traditions. The first project is centered in the small temple-village of Alvar Tirunagari, in deep south India. The site is an old one, attested to from at least the late 8th century as a sacred site. The Visnu temple was built up around the 15th century. With the building of the temple, an elaborate ritual culture also developed between the 11th and the 15th CE. South India (indeed India in general) is known for the close relationships between texts and performance. Performance is one the keys ways of transmitting knowledge, especially of a religious/moral kind as well as a means of building communities. Most temples in south India supported multiple performance traditions. However, with the advent of colonialism and then in post-independent India, the change in the structures of patronage – from the patronage of landowners to patronage of the State – many of these traditions gradually faded away because of lack of financial support. In this transformation, many performers lost hereditary land, which was their main source of income. The temple of Alvar Tirunagari is unique because it continues to support multiple performance traditions, all occur within a ritual context. Of course, some traditions at Alvar Tirunagari have died, and still others are very much in need of assistance. Alvar Tirunagari has four main performance traditions, known as Araiyar Cevai, Kavi Pattu, Dasi Attam and Kattiyam. Araiyar Cevai is the oldest of the performance traditions. It is a ritual service that involves singing and dancing as a means of interpreting sacred texts. Araiyar Cevai survives in only 3 temples today, and Alvar Tirunagari is one of them. There are two brothers—Nathamuni and Srinivasan —who perform this service. Meeting the Araiyar-s at Alvar Tirunagari was preceded by years of fieldwork and a close relationship with the Araiyars of another temple site called Srivillipatur. The Araiyars asked that this manuscript be conserved, digitized and transcribed into modern Tamil (and Sanskrit). Under the auspices of LERP, and the National Endowment for the Humanities and the American Institute of Indian Studies, the transcription and digitizing was completed in 2007 with the help of the French Institute of Pondicherry. This required that the manuscript first be cleaned and then photographed. The manuscript, along with digital copies and hard copies were returned to the Araiyars in 2008 and they were able to use the hard copies for the first time instead of the fragile palm leaf palm leaf during the main festival of December 2008. It’s important to stress that the Lost & Endangered Religions Project didn’t do this to publish the manuscript or make these materials available for public use, but to let this community decide what to be done with their own manuscript that would best serve their tradition. It should be noted that this approach makes it difficult to receive grants as almost all fellowships and endowments require publication of all research data and results. Another important tradition at Alvar Tirunagari is the Dasi Attam tradition performed by the Nattuvanar. He is a musician, who sings songs unique to this temple. About 50 years ago, female dancers would have accompanied him, but they do not do so any longer. At Alvar Tirunagari, there is only one Nattuvanar left. His name is Natarajan. While his deceased brother knew a the full repertoire of 108 songs, Natarajan remembers only 37. When Layne and Archana met him in 2005 he did not have any one who could take over the performance. However, when we spoke to him at length about the value of his traditions, it made an impact. His nephew Kannan took up learning the songs, and now helps him in the performance. Last year Archana was consulting with a senior scholar at the École française d'Extrême-Orient in Pondicherry with whom she has worked for years on Sri Vaisnava manuscripts. When she mentioned the work in Alvar Tirunagari, the senior scholar suddenly remembered that the Ecole did have a large collection of manuscripts from Alvar Tirunagari that had remained uncatalogued for more than 50 years. Examining them, Archana discovered a palm leaf manuscript containing all 108 of the original Dasi Attam songs of Nattuvanar. Layne and Archana are on their way to Pondicherry as we speak to make arrangements to have these songs digitized, transcribed and returned to Natarajan. One of the saddest stories in the history of performance traditions in south India has to do with hereditary female performers known as Devadasis. Traditionally, Devadasis did not get married, but lived in matrilocal, matrifocal and matrilineal homes. They were dancers and singers, who performed ritual tasks in the temple as well as performing in the contexts of royal courts and many public venues. Many of them were dedicated to the temple deity at a young age in a ceremony where the taali (a yellow cord) was tied about their necks as a groom would do around the neck of his young bride. Devadasis were thought to embody the power of auspiciousness called saubhagya, and thus could wave the pot-lamp (kumbha-dipa) in an act of removing the “evil-eye” (drsti) from the deity and from other human beings. This practice, called “aarati” is the most commonly performed rite seen in Hindu temples today. These women occupied a special place in south Indian communities, as they were regarded as eternally auspicious (because, being wedded to a god, they could never be widowed). ‘Dedication’ involved a ceremony called pottukkattutal (“tying of the pottu”) in which a girl would have a “marriage” cord tied around her neck. These types of rituals “fulfilled” the social need for a rite of passage (that of marriage), and marked the woman’s lifestyle as distinct from that of householding women. Some devadasis served a similar ritual and performative function in the royal courts and were symbolically married to the sword of the king. However, because of “social purity” and reform movements in the early twentieth century, devadasis were labeled as “temple prostitutes” and their lifestyle was criminalized in the year 1947, the same year that India achieved independence from colonial rule. Today devadasis live in dire circumstances in rural South India. They have been denied many fundamental rights, including that of citizenship in the nation. Many had to sell their temple jewelry and eventually become the prostitutes they were labeled as just to survive. Saride Manikyam was the last devadasi to be dedicated at the Madanagopalasvami Temple,at Ballipadu, Andhra Pradesh. I showed a more recent picture of her and an older one in which she is wearing a matisar, a nine-yard sari worn in the orthodox Brahmin manner, to perform dance and music during the nityapuja at Ballipadu, indicating the high esteem in which she was held when the role of the devadsasi was a valued one. I also showed images of another devadasi, Maddulla Janakamma, showing hand gestures used in the dances of the devadasis. These hand gestures are called rati-mudras, and were erased from the high-caste appropriations of the devadasi dance that occurred in the twentieth century. In 1929, the Madras Legislative Assembly passed a Bill that would ban the pottu-tying ceremony in these communities. In 1947, the Bill was made into an Act and was expanded to criminalize dancing and the waving of the pot-lamp by devadasis. The “symbolic marriage” of the devadasis was outlawed and with it, these women lost their temple rights and their rights to their land. By 1956, the Act was amended to outlaw any kind of public performance of music and dance by any woman related to these communities (not just women who underwent the pottu ceremony). The devadasis could therefore no longer perform their repertoire, and they could not teach it either. The few remaining dancers fell into destitution and then prostitution. To add insult to injury, the dance of the devadasis were appropriated by upper caste women, even while the women were marginalized. Their dance was cleaned up, and recast as a spiritual, national art form, its origins forgotten or denied. Many of the surviving devadasis huddled together in small communities in the “red-light” districts of the cities. Professor Davesh Soneji of McGill University has spent the past 15 years working with the communities of these women, in order to record their repertoire and their life stories. Along with Hari Krishnan, his collaborator, who is a dancer, he has meticulously recorded and learned the repertoire of the last surviving Dasis. In 2003, along with Hari Krishnan he began the Mangala Initiative, a non-profit organization to help support these communities of women. Mangala is a service organization partnered with the Lost and Endangered Religions Project to do this work in South India. I introduced Raul and let him explain, through Rachael, about the Iniciativa Indigena Global. * Acjachemen from the U.S.
* Heathen from the U.S.
* Hindu from India, the U.K. & the U.S.
* Lenape from the U.S.
* Mohawk from the U.S.
* Shinto from Japan & the U.S.
* Taoist from the U.S.
* Wicca from Canada & the U.S.
* Providing cameras & recorders to indigenous practitioners for the recording of their own traditions (an application of our project originally planned for the Naxi). * Development of a website for global indigenous networking (which is underway). * Facilitation of the sale of traditional medicines to benefit traditional communities. * Cooperative efforts to preserve sacred sites and access to them, including the idea of employing and empowering “Indigenous Custodians”, much as has been done with Uluru in Australia. I had cut the program way short, fearing it would go way over, but we ended up ending with a comfortable margin and the Q & A became a lively discussion of methodology, suggestions for projects, and appreciation for the work. I was glad that both URI Director Charles Gibbs and ICP Director Paul Chaffee were their, as I had learned much from them on the importance of building relationships in this kind of work and this gave me an opportunity to thank them publicly. Lots of folks wanted to know how we fund this work and I explained that (so far) it was all out of our own pockets, with the very kind help of one private donor. One person in the audience was David Busch, a reporter for the Australian Broadcasting Network. He told me that LERP’s story was the most inspiring one he had heard at this Parliament and asked if he could interview me later. We arranged a time on the last day of the conference. Folks hung around so long to talk and ask more questions that there was no chance of making it to another program in the next time-slot. Accordingly, I kept schmoozing and gradually made my way to my next scheduled meeting. While it might seem odd that it could take almost two hours to cross a building, you haven’t reckoned with the sheep size of the Melbourne Exhibition Hall or the ease with which one can get roped into conversations when you know hundreds of the people attended an event and haven’t seen many of them face-to-face for 5 years. Around 6:30pm, folks started assembling at the prearranged coordinates to have a dinner meeting of United Religions Initiative folks involved in the ongoing process of creating a Wisdom & Vision Council in the URI. The Wisdom & Vision Council was proposed as a way to sustain engagement with the URI by former Trustees and Board Members with the goal of maintaining the institutional memory of the URI (Wisdom) and looking at the long-term needs of the organization in a way that the Global Council, who is focused on the day-to-day administration of the URI, can’t (Vision). The W&V Council is also envisioned as a pool to tap to be counselors, mediators, ambassadors, etc., as needed by the Global Council. URI Global Council Chair Yoland Trevino, URI Director Charles Gibbs, W&V Council interim coordinators Kay Lindahl & myself, and presumptive W&V Council member Raul Mamani all went across the street to what is supposed o be the largest Casino in the southern hemisphere. There was a nice and quiet Chinese restaurant – Lucky Chan – where we could meet and talk (the only place nearby that wasn’t a food court). We had a pleasant dinner discussion about the progress of the W&V Council. The Global Council had just appointed the second Trustee liaison we needed to be an official Advisory Committee to the Global Council. Now, when we got home, Kay and I would start the process of contacting former Trustees and Board members to assess their level of interest and engagement. Raul and Yoland brought up that, early on, we had discussed the idea of a “Wisdom Council” consisting of revered spiritual elders in the many faith traditions to whom we might turn for guidance. Charles, Kay, and I said that we still thought that identifying such individuals and seeking such advice this was a good thing, but that it should be done informally and as needed. The creation of a standing body with such a title would result in the same problems the Parliament had when it had an Assembly of the World’s Religious and Spiritual Leaders: 1) Too many people saying “How come so-and-so is in and I’m not?”, and 2) Too many people wanting to be part of it for the title only, and not to actually do any work or be of real assistance. We all hoped for the day when humanity could be enlightened enough to abandon such petty concerns (but if we reach that day, will we need a Wisdom Council?). There. Bit by bit and byte by byte, I’m getting more & more caught up. The Parliament of the World's Religions has ended, at least for now at this time and space (Melbourne). The Parliament intends to continue with its new online network PeaceNext. PeaceNext will help keep these newly formed relationships intact between now and the next Parliament. My presentations went well. I was blessed to be on a panel on Tuesday with such brilliant and insightful women from around the world. I hope to stay in touch with them and continue collaborating on projects. I would have liked the perspective of an African or African American woman on our panel, but we were at a maximum number with 8 and then 10 anyway. We couldn't really afford to add another to our panel, for it would have limited each individual's speaking time even further. I leave Melbourne in a few hours for Christchurch, New Zealand. I will continue processing my experiences at the Parliament and write for the COG newsletter. Today I went to a 9:30 session - Understanding Vodun: a West African Spirituality by Robert Houndohome Hounon of Benin. Also known as His Majesty Daagbo Hounion Houna II, Robert Houndohome Hounon is the Supreme Spiritual Leader of the Great Council of the Vodun Hwendo tradition. He was speaking in French with a translator. I understand that the East Coast Pagan community had contributed money to get him to the Parliament. His basic message seems to be that the diaspora is doing it all wrong and should come back to Africa to get the pure religion from one of the countries of the Gulf of Guinea. He doesn't have a website yet. There was the inevitable "animal sacrifice" question...twice. He said yes, they do animal sacrifice but if the animal screams it gets a reprieve. Someone asked him about Vodun's views on modern issues like abortion, vegetarianism and euthanasia. He said that Vodun condemned abortion because all life is sacred, vegetarianism is an individual choice because one's food taboos are determined by the sign one is born under and he didn't respond about euthanasia. January 10th is a national Vodun holiday in Benin and they have received some recognition there. There are monuments to the gate of departure (leaving for slavery) and the gate of return (slaves descendants returning). It was never discussed whether non-Africans could practice Vodun but His Magesty seemed to be talking only to the black members of the audience. At the end of his presentation Angie Buchanan presented him with one of the beautiful shakers made by Julee Higginbotham. Hmm, have I mentioned those? There are four symbolic ceramic shakers that the Pagans were giving to various groups and elders - the Parliament committee in Chicago, the committee in Melbourne, this guy and hopefully the Dalai Lama. Here is an article on them from her local paper, St. Louis Today. This presentation really made me glad that the Orixa have reached out to me with the new religious movement of Umbanda. I feel no need to go back to Africa for some kind of authenticity. I love the syncretic nature of Umbanda and I don't need an African "King" telling me what is truth. And his anti-abortion stance also put me off considerably as you might imagine. I was excited to see this panel in the program guide, since I have long said that most of the Wiccans I know are panentheists, they just haven’t heard of the term. * The word “panentheism” has been a sticking point, since most people confuse it with “pantheism”, but we are stuck with it until someone come up with something better. * It can be translated both as “all in God (or the Divine)” and “God in all”. * Panentheism affirms neither pure transcendence nor pure immanence. * The “en” in panentheism contains the concepts of 1) inherence, 2) strong ontological dependence, and 3) participation. * A panentheist believes that things (objects, people, concepts, etc.) appear to be separate, but are ultimately one, being different manifestations of that One. Many panenetheists are fond of saying that the world is the body of God. (Note: While the Pagan Neoplatonists of the ancient world were panentheists, the term was coined by a Christian in the 19th century and most of the modern writers have been Christians who have been unaware, or dismissive, of its Pagan heritage.) Most of the Wiccans I know think of their bodies as themselves, but of themselves as being more than just their material body (as experience with astral projection quickly demonstrates). Assuming that the Divine must AT LEAST possess all of the qualities that we do, panentheists accept pantheism but move beyond it to include a transcendent aspect of the Divine as well. In VERY gross terms. If you believe that the Divine is fully manifest as the universe and when the universe ends, the Divine ends, you are a pantheist. If you believe that the Divine is fully manifest as the universe, but when the universe ends, the Divine continues, to “reincarnate”, if you will, in a new Big Bang, then you are a panentheist. Both pantheism and panentheism include a concept of the Divine as ultimately One, with many manifestations. “Clayton” explained that the One cannot be less conscious than we are, but may well be considerably more so in ways we can’t comprehend. Thus, it is a mistake to think of the One as a completely unconscious concept, but it is also a mistake to think of it as a conscious being even remotely like big, bearded guy in the sky. “Clayton” sees panentheism’s acceptance of endless manifestations of the Divine Unity as embracing the deity concepts of all faiths. He traced the development of this idea through the Renaissance philosophers like Giordano Bruno, who were persecuted as heretics and sorcerers. Panelist Purushottama Bilmoria, Prof. of Philosophy & Comparative Studies at Deakin University in Australia, spoke about Eastern writers on panentheism. He asked, “If the world is the body of God, can he/she/it evolve? Get sick? Age? Die? Reach enlightenment?” He stressed the distinction between “monism” – the belief that everything is ultimately One – and “monotheism” – the belief that everything is ultimately one being, usually a male singular God. The former is closer to ancient and Eastern ideas of panentheism, while the latter is found more in Western Christian writers. He cited several Indian writers, from antiquity to the present. Prabhu finally spoke for himself. He addressed a more traditionally Western view of panentheism. He appreciated Mathew’s comments about the problem of “-theism”, but felt that her alternative just opened another debate that we couldn’t get into here. Since this is a religious conference, he said, he wanted to bring the topic back to religion. He described a spectrum of religious views, from the purely transcendent to purely immanent, with panentheism smack dab in the middle. He stressed that the goal of those espousing panenetheism today is to overcome dualism, especially the perceived or claimed split between matter and spirit. The Old Testament model of humanity dominating and subduing the Earth laid the roots of ecological degradation, whereas if the world is a manifestation of the Divine, then EVERYTHING must be treated with respect. Someone asked Prabhu where to start exploring panentheistic theology. He directed the questioner to writings on Neoplatonism and Ecofeminism. In the general Q & A session, the panel often fell into arguments between Mathews and the others over religious language. Prabhu kept saying that we were in a religious conference so she should just expect this and get over it. There was a brief discussion of how panentheism gets around theodicy or “the problem of evil. Kaye of EarthSpirit also commented on the off-putting nature of “-theism” and observed that theistic language was often used to subvert non-Abrahamic religions into an Abrahamic framework. Prabhu agreed and said that panentheism offers a new way to avoid colonial and imperialist interpretations and redefine not just our relation to God or the Gods, but the nature of the Divine in a more inclusive way. I didn’t get to ask it and the person most likely to have an answer, Prabhu, took off immediately to catch a plane. I spoke with Purushottama about the similarities between Wicca and panentheism and it turned out that he lives in Berkeley CA! We exchanged cards and will get together for dinner when we get back home. I joined the mob of Pagans around Freya Mathews who were all eager to tell her that the kind of panentheism she was proposing is what the Wiccans have been doing for over 50 years. She seemed somewhat skeptical, but gave me a copy of the paper she had had to abbreviate for this panel – “Metaphysics: A Once and Future Discourse”. The panel was very interesting and I was gald to see the return of panentheism to popular discussion, but I was disappointed by the almost total lack of reference to anything by Christian or Eastern forms of panentheism. Once again, a topic at the Parliament was directly relevant to us as contemporary Pagans, but no one thought that we would have anything to offer. We really need to move beyond the topics obviously and always associated with Neopaganism – ritual, women, nature, etc. – and get the wider interfaith community to understand that we have yet more to offer. I went into the cafeteria to look for Anna, who was saving a space for me. The place is so large that, even with her looking for me, it took 5 minutes to find her. On the way, I was stopped by Johannes Marainen, the Saami gentleman I had met briefly with Raul (yesterday?). 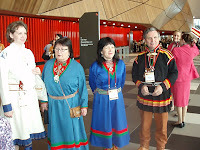 He was eager to give me a copy of his booklet “Sapmi: The Land of the Sami” and his email so we could stay in contact about the Iniciativa Indigena Global. I hadn’t thought he had really noticed me when we first met, but I apparently made some sort of favorable impression. 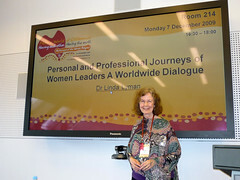 The last presentation of the day for me was "Personal and Professional Journeys of Women Leaders: a Worldwide Dialogue" by Dr. Linda Lyman of Illinois State University. She highlighted the stories of women in education who participated in the 2007 Rome conference: 'Sharing the Spirit, Fanning the Flame: Women Leading Education Across the Continents'. Then we broke into groups of 5-6 and talked about how the themes - scholarhip, activism, introspection and mentoring within our educational, career and spiritual lives - related to our own experience. My group was particular rewarding because of the presence of Jan Chaffee who, with her husband Paul, runs the Interfaith Center at the Presidio. Hearing Jan's stories and getting to know her better was a wonderful opportunity. I have always admired her warmth and competence. Also in our group was a young woman from Saudi Arabia who has faced challenges in getting an education. She had only gotten a batchelor's degree when a university opened in Bahrain because in Saudi Arabia there were only teacher colleges or nursing schools for women and she wasn't drawn to those professions. At this point she has a bs in information science, a masters in human resources and a masters in public administration and she is going to start a doctorate soon. Another woman in our group had faced both racial and gender discrimination and lived through both the civil rights and women's movement. She has also survived a rare and virulent form of breast cancer. So many stories! Yesterday I co-presented “Women of the World at the Parliament of Religions, Chicago, 1893” with Allison Stokes, Founding Director of Women's Interfaith Institute in NY. I intend to make my presentation available from the COG website. Pagans are involved in youth programming. Isobel Arthen was on panel of environmental activists of faith, with Christian Australian and a few indigenous people (including a Native American from Montana named Leo and indigenous Australian who plays the didgeridoo well). There are service projects most days youth can sign up for. A bus picks them up at the conference site. Youth go as a group for a service project. At a women’s prayer for the Earth morning observance, I wanted to move around. I realized how important ritual actions, sympathetic magick, and movement were to our tradition. I felt unequipped to direct movement or ritual on the spot without another Pagan there to help. I offered a prayer statement informed by Riane Eisler’s work on creating a caring economy--that I believed a radical restructuring of society was needed to heal the Earth. I wanted to focus on healthy growth, education, communication, and relationships, often considered “women’s” areas. I was asked to “Chair” Andrew Cohen’s presentation. This involved introducing him: “Andrew Cohen is a spiritual teacher and founder of EnlightenNext magazine (formerly What Is Enlightenment). A visionary thinker, Cohen is widely recognized for his original contribution to the emerging field of evolutionary spirituality.” Paul Chaffee from the Interfaith Center at the Presidio said positive things about Cohen’s later Open Space. Tomorrow I preside on a panel of multifaith women. The session is from 2:30-4. Shortly afterwards is an Open Space session with the same women. Then I went off to Australian Pagans Speak: a Community Forum featuring Fabienne Morgana, Glenys Livingstone, She' D'Montford, Gede Parma and Linda Ward. Their presentation was especially wonderful because they represented so many different facets of Australian Paganism from solitaries to members and founders of traditions to Pagans doing interfaith work. So many were informed by the environment of their land and by the many cultures who meet here. She' D'Montford had a power point on the myths about Pagans. She came into the session wearing a black robe and ugly green mask and then stripped down to her slim and lovely self to symbolize stripping away the myths. Her presentation isn't available anywhere but she says there is a book on the way. Ms. Livingstone, who attended Berkeley's GTU, wrote 'PaGaian Cosmology' which brings together a religious practice of seasonal ritual based in a contemporary scientific sense of the cosmos and female imagery for the Sacred. It is available in print or can be read online at http://pagaian.org/. I had met Gede Parma the other day at Magick Happens and leafed through his Llewellyn book Spirited: Taking Paganism Beyond the Circle which looked quite interesting. I was glad to see the presence of a young queer voice amongst the panelists. Fabienne Morgana talked about her upbringing on a ranch only slightly smaller than Rhode Island. She makes "focus beads" for many occasions and has made them for specific occasions. She said she had made some for the Parliament but I didn't manage to get information about them. Linda Ward, the Interfaith Representative for the Pagan Awareness Network, then spoke about their process of engaging in interfaith dialogue here in Australia. She said they first time they approached an inter-religious meeting they were told, "Oh no, there is an international protocol that says Pagans can't be included." They have come a long way since then! By continuing engagement they have become partners in the local and now global interfaith movement. It was very interesting to hear the stories of our co-religionists and I hope that the sharing and fellowship we have here at the Parliament will enrich both the Australian and non-Australian Pagans and Wiccans. I started my morning with a devotional called Living in Peace not Pieces: How to Find and Remain Anchored in Joy, Peace, and Bliss amidst the Waves and Storms of Daily Life by HH Pujya Swami Chidanand Saraswati. He is a great storyteller and his voice for matras is amazing. We began with him singing mantras and then Sadhvi Bhagwati did a guided meditation. He said people often come to him and say "I want peace". He says to get rid of the "I want" and what is left? Ego and desire block our peace. Daily prayer and meditation are cleansing. Prayer, in any language, to any divine form, is the practitioner fully engaged in devotion. Meditation is when God talks back. By humbly offering all of our self to the divine we are cleansed and become anchored in the divine which will bring us peace. They gave all of the participants a copy of his book, Peace: For Us, For our Families, For our Communities and for the World. I have read a couple of passages and I must say his stories come right through the printed page. I am so glad to have been introduced to his work! And having quickly googled him, I find his site at http://www.parmarth.com/ and he has audio at http://www.parmarth.com/audio/audio.html. I'm off to download some inspirational mantras. On Saturday evening I headed back to the Arts House venue for the Magick Happens Cirque Noir Masquerade Ball. When I arrived burlesque dancers were putting on a lovely show. Then the Stiletto Sisters, a band containing a fiddle, accordian and bass, wandered around playing Gypsy/Eastern European music for small audiences. The level of entertainment at this event was truly stellar. The lovely burlesque ladies soon began circulating through the crowd with trays of appetizers. I got myself a glass of spiced mead at the bar and tucked into the food - shooter sized hamburgers but on lovely crunchy rolls rather than insipid white bread, spring rolls, prawn dumplings and an array of puff pastries filled with cheese, cheese & spinach, bacon & cheese and mystery vegatables. There was also chicken satay and desserts but I skipped the chicken and was way to full for desert! At 10pm Spiral Dance started their first set (they were supposed to get a break but they played straight for an hour!). Those who know me know that I am a hopeless fan girl for Spiral Dance and their live performance did not disappoint. Such great performers!!!! I had heard most of the tunes they did but there were perhaps three that were new to me. I hope there is a new album in the offing! They taught a Breton dance for power raising and got people up and dancing. There was also a spiral dance danced at the end. The energy was magical and delightful. I listened to about half an hour of Wendy Rule (playing with her guitar, a fiddler and a bass) before realizing I was nodding off and it was after midnight. I love Wendy's amazing voice but I was worried about getting a taxi. Nick from Spiral Dance came outside to help me find a taxi and was so lovely and gracious. He said that on their tours of the USA (East Coast only, I've been watching for them) people had been so nice to them that he was paying it forward by helping me. I said they should do a West Coast tour and come to PantheaCon. I got back to the hotel about 1:30am and fell over. But what a fabulous night! The local community is really nice, their costumes for the masquerade were amazing, the music was beyond fabulous and the food was fine and served by beautiful women. I mean, what's not to like! The variety and number of programs on offer is staggering! In any given 90-minute timeslot there are between 20 and 30 programs scheduled! At 9:30am, Anna and I attended “Challenge of Shinto: An Approach to Living Together in Diversity”, given by Rev. Munemichi Kurozumi. I have known Michi since we worked together in planning meetings in Chicago in 1998 for the 1999 Parliament. He is the son and heir of the 6th Patriarch of Kurozumikyo Shinto. (Long time readers of my reports may remember the “Titanic” photo of him and me on Table Mountain at the 1999 Parliament in Cape Town, South Africa. Michi explained the history of Shinto through three periods. The early period, in which Shinto was the indigenous folk religion of Japan. The Meiji Period (1860’s – 1945), during which Shinto was welded to the State and made into a State religion with the Emperor as the primary God (in a misguided effort to emulate the success of Western nations with state churches). And the post-War period, in which State Shinto had been abolished, the Emperor was now just a symbolic national “parent”, and many smaller expressions of Shinto had flourished. At 11:30am, we went to “Interreligious Regional Concerns: Latin America”, a discussion to which Raul had been asked to contribute. The group was small, so we all met in a circle. The facilitator, an indigenous El Salvadorian named Marta, asked each person to share, vocally and on a pad passed around, their name, contact email, and concerns. She would then circulate the information so folks could be connected with others who could be of assistance. There was one Catholic monk who organizes interfaith dialogues for monks and nuns and is interested in setting up dialogues in Latin America. There was a Korean student who was preparing for a class on Liberation theology in Latin America. Everyone else who attended was primarily interested in indigenous issues. There was great concern that the language barrier keeps Latin America out-of-the-loop in interfaith, and that this and the financial barrier keeps Latin American indigenous representatives away. The group decided that it wanted to meet again to seek productive ways to address their concerns with the Parliament’s organizers. Also, most of them had never heard of the United Religions Initiative and were very interested in how the URI might help with their own networking efforts. After lunch, we wandered through the Exhibition Room for our first pass through the booths. I have learned, after attending four Parliaments, that the folks most likely to get booths at a Parliament are also the folks most likely to be intently evangelical about their particular Teacher. (Of course, there are exceptions – the Pagans always being one.) As a result, there is an art to successfully navigating the Exhibition Room with any quickness: Walk in the middle of the aisle; don’t get to close to a booth until you have decided to enter it. Avoid eye-contact with booth minders; look at their signage instead. Only if the items on display catch your interest do you then engage the people inside. Otherwise, every other booth will become a half-hour immersion experience in another faith tradition. That’s fine, if that’s what you’re looking for, but can make you very late for a meeting or program if you aren’t. Another booth was staffed by the followers of Dharma Master Hsin Tao. He maintains a marvelous Museum of World Religions in Taipei, Taiwan, which I have visited twice . The first time I met him, he asked me to send information about Wicca. The second time, I met with him at Wu Sheng monastery on Ling Jiou Mountain on the north coast and presented him with all the items necessary to construct a Wiccan altar in the Museum. The items were donated by members of the Northern California Local Council of the Covenant of the Goddess, and included my own first cord and athame. I hope that there will be an opportunity to meet with him here. At 4:30pm, we went to “URI – Global Community Gathering”, a reception for the many United Religions Initiative members attending the Parliament. URI Director Charles Gibbs welcomed everyone and introduced URI Global Council Chair Yoland Trevino. Yoland, in traditional Mayan garb, introduced aboriginal elder Uncle Max Duramunmun Harrison of the Yuin nation. She asked his permission for our being there, and when he agreed, presented him with gifts from the URI. Uncle Max was moved to tears and expressed his gratitude and feeling of being with family. I bumped into Kay Lindahl, co-coordinator of the URI’s Wisdom & Vision Council, and we immediately cornered Charles & Yoland to arrange a dinner meeting to discuss the latest developments in the creation of this council of former URI Trustees. Gerardo Gonzalez, another fellow former URI Trustee, arrived late. We hadn’t seen each other in a few years, so we quickly caught up. Gerardo is one of the prime movers behind the effort to get the UN to declare 2011-2020 the “UN Decade of Interreligious and Intercultural Dialogue, Understanding and Cooperation for Peace”. Unfortunately, his program tomorrow is scheduled against my “Lost & Endangered Religions” program. By the time the URI program ended, it was after 6:00pm, we were all hungry, and there was no place nearby that would be open. Anna, Raul, Yoland, Rachael, and I retired to Rachael’s and Rowan’s room, in the Hilton attached to the Parliament venue, to order room service and work on tomorrow’s “Lost & Endangered Religions Project” program. We finished around 10:00pm and Anna and I caught a cab back to our hotel, as the sky seemed to be threatening rain. It's just after 3:00am. Tomorrow (today!) is the big day for my program. Wish me luck! The last two days have been a balancing act. I've been making connections with Pagans and Indigenous people from all around the world, trying to balance my commitment to Raul, as a translator, my promise to NAIN as technical advisor, and the constant requests from URI to help, go here or there, do this or that. At the end of this third day I have finally been able to take a bit of time to gather my thoughts and write a report. On the first day I was so busy that all Raul could do was point out a workshop or two he wanted to see (which we did)and then follow me around as I tried to be a dozen places at once working to find taping sites and arrange equipment. As a result neither of us ate at all after an early breakfast. By the time we made the Indigenous Reception at six we were both starving and, I fear, spent much time trying to look casual as we scarfed down everything offered, while talking with as many representatives as we could corner (who were also busy scarfing down everything available). One of those was an Ainu elder from Japan who, despite his lack of English or Spanish, insisted on explaining that the sounds in the word "Ainu" represented a variety of concepts. The first of which was that the "ai" sound meant dirt, indicating that these people were the color of dirt and therefore of no value. The second was that the "a" meant elder when pronounced in a particular manner and "youth" when pronounced in another. The rest of the word meant "to listen to." Ergo, the Ainu could mean to listen to the youth or listen to the elders. This after a rather difficult translation by a young man who had apparently been brought along specifically as a translator. Of course it became my turn when Raul explained many of the concepts of his people's beliefs. The young man and I thanked each other profusely afterward, both of us exhausted by the effort to work with a vocabulary with which we were not particularly familiar. The next morning Raul wanted to attend a morning ritual by Francois Paulette, a Dene (North American indigenous). I got there early and found Mr. Paulette sitting in a chair. I sat beside him and asked what he needed. He said, "you know, this is not how we normally do things. This is a bit strange." I asked him if he wanted a circle or wanted the chairs removed. He asked me what the protocol was. I told him it was whatever he wanted it to be. If he wanted a circle he would have one. He said that it would be nice, so I told the boys setting up the room that we needed a circle. They looked at me like I was crazy and replied that it wasn't called for in the set up. I said that Mr. Paulette had not understood that he needed to call for a special layout and that we would need a circle because that is the way we do things and to please make it so. They simply didn't seem to understand what we needed so I just asked everyone to move the chairs out of the way. The relief on Mr. Paulette's face was good to see. He then asked me to get a bowl for him which I did and he began to tell a story about how he lived in the bush and lived in the old ways off the grid, raising his children in the same way. While he spoke he lit the sweet grass and explained smudging. After that we all smudged and he began the ceremony by calling the east, naming its attributes and asking its blessing upon us. And so he did with the other directions as well. He then announced that the ceremony was over and thanked us all for our presence. During the next two days I attended many more workshops and most of them were indigenous issues. No matter what the purpose of the gathering however, or who was doing it, from the opening ceremony of the Plenary to the smallest gathering they were careful to say what began to sound to me like a very formulaic phrase. "I would like to begin by thanking the people of this land for welcoming us here. I would thank the ancestors and the people who are here now for allowing us to use this land." One image engraved in my mind is being so tired and in so much pain that I was just waiting for the opening Plenary to finish when a keynote speaker took the podium. His name was His Holiness Sri Sri Ravi Shankar. He didn't talk as though talking from a prepared speach, Rather he talked to us. He said many things that were both funny and poinient but the one thing I remember most is his saying that when religion was dominated by people who were determined that their god was the only one right and true path and that everyone else was bound to hell, then there would truely be hell on Earth. There was a lot of nervous laughter but mine was not. I was awake and listening and for just a moment my mind was removed from the pain that had plagued me all day. From an outsider's point of view it is very hard to tell what is residual anger and what is earned indignation, but there are some clear issues at this Parliament around the indigenous presence. I saw an indigenous person lobby for inappropriate force of action in a workshop and then enter a reception and clean out about half of the food made available there, and leave, clearly daring anyone to stop him. If I had had to deal with that type of attitude on a day in and day out basis it would be very hard for me not to tar every other person like him with the same brush. On the other hand I watched an indigenous Australian elder of 70 plus years asked to leave the indigenous reception being told he did not have an invitation. They basically closed the door in his face; his land his place, but he wasn't welcome. I spoke with him later. He was a true story teller and elder of his people and there was not an insincere cell in his body. As I got to know him better I realized that he wasn't even angry. It was done and could not be undone so no reason to allow them to do more harm to him by brooding on it. We had to walk a piece to catch a cab for dinner and some with us who knew him better were concerned that it might be a bit much for him so I let him borrow my cart. He was so excited, like a kid with a new toy, so I cranked it up and let him run it out. Its a speedy little number at full throttle. Now he's always teasing me about stealing it while my back is turned. In every indigenous meeting no matter what the topic the traits and values that were always mentioned and that were lamented as in danger of being lost to the capitalistic values of acquisition were, balance, sharing, selflessness, reciprocity, and closeness to nature. All terms of respect were family relationships. I am addressed as sister, or aunt depending upon the age of the person addressing me. It quickly became clear that those I was speaking with both for myself and on behalf of Raul felt that a person would be judged to be indigenous more by his reflection of these values than by phenotype or genotype. After a few workshops it became clear that Raul was the only one who had shown up from all of South America. There may be one Peruvian but we have yet to find him. For all of that, when Raul wished to attend the indigenous conference we were told that there was no room at the table but they might try to squeeze him in. When we explained that he would need a translator, the response was "well that would be two then and there is definitely no room." When they thought that it might be me translating, they told me that I would not be allowed in under any circumstances as they knew me as a Pagan from the states. Raul was slightly incensed and said at that point that he preferred not to go, though in truth I think that he really did wish to attend and was saying that more for my sake. And that is another issue completely. There are no translators...anywhere. If you did not bring your own translator you are out of luck. Not a professional translator in the house; a far cry from the last parliament in which simulcasting was the norm for large workshops and professional translators were available to anyone who asked during a workshop. So...I think the web casting went swimmingly. No one thought to bring tapes after two of us said that we could not afford to supply them, no one thought to bring adaptors, after a long discussion on the list, and no plans for a site had been made. After a mad scramble we decided on a site and began set up only to find that we could plug nothing in. Someone ran to purchase an extension cord and returned only to find that American plugs don't fit in Aussi sockets. Another trip to the store for adaptors. With everything up and ready we discovered that no one had purchased the tapes necessary for the camera. Another trip to the store. When everything was up and ready I discovered that what I had thought was a transformer on my transmitter cord apparently was just a surge protector of sorts and was blown clean out making my wireless transmitter useless and with it went the lavelier mics I had schleped half way around the world. I told someone to put the mics in the sound box while I frantically worked to change the sound to a wireless hand held I'd brought as a spare. The shoot done I was collecting my equipement only to find that someone had thrown the laveliers down on top of the black tripod covers instead of putting them where they belonged and then proceeded to grind one of them into oblivion. Deep learning experience accompanied by heavy sigh here. Today I could not be present at the actual taping but went to set up and test equipment and set lighting. All was working well and the camera levels were set. At the eleventh hour a frantic call came in that the equipment was not working. I rushed back on zippy, my trusty metal steed and lo, all seemed to be working fine. It was finally determined that the equipment was bewitched and would only work in my presence so I replaced the cordless with a new wired mic, placed a gees upon it to work for me at a distance and ran to get to another meeting. After a four o'clock reception of the United Religions Initiative, Don and Anna, Raul, Yoland and myself trooped back to Rowan's and my room to grab dinner while Don, Raul and Yoland worked on the workshop for the Lost and Endangered Religions Initiative Presentation tomorrow. Dinner finally came, two hamburgers short and we waited another half hour for those while plans for the workshop were finalized and I started this report. At ten Yoland and Raul finally left to work on reports of their own, Don and Anna stayed to finish dinner before going to their hotel to continue to work on polishing the report. Anna mentioned that Michelle had a workshop directly across from Don and I said that I would go to that for us. Don then informed me that I would, in fact not be going to Michelle's workshop because I had to translate for Raul as Yoland had been called away due to a conflict in scheduling. This they could have told me while they were working on the report so that I might have a better idea what the heck was going on tomorrow. yet another heavy sigh. It is now one o'clock and I can no longer see the page but I still have to check the schedule to see what and where I have to be tomorrow.